We have a ASP.NET Core MVC application and recently moved to latest public release and trying to get localization to work with your tool. Do you expect Jollans Multi Language tool to support ASP.NET Core's new way of handling Localization/Globalization? Introduced in ASP.NET Core, IStringLocalizer and IStringLocalizer were architected to improve productivity when developing localized apps. IStringLocalizer uses the ResourceManager and ResourceReader to provide culture-specific resources at run time. I will certainly look into it. Normally, it makes sense for me to use the methods which Microsoft provide. First I want to look into supporting Visual Studio 2017. How is it looking for Visual Studio 2017 support? I am sure that you know a lot more about MVC applications than I do. Maybe you can help my understanding of how to use the IStringLocalizer interface. What I don't understand, is how to handle strings in classes which do not derive from Controller. Sure, I could add an IStringLocalizer (or maybe IStringLocalizerFactory) parameter to the constructor, but then whoever creates the class will have to provide it. I can't find any examples about how to the new MVC localization method in other classes. Because I am not really an MVC programmer, I think I am missing something. 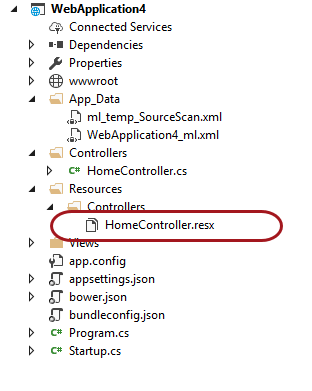 Is it possible that MVC applications just don't contain other classes (not deriving from Controller)? That is hard to believe. At present, it looks like I will be able to support IStringLocalizer in Controller classes, but fall back to ml_string or named resources in other classes. I have now understood a lot more about working with dependency injection, after asking (and then answering) a question on Stack Overflow. Sorry if I'm pushing it, but have you been thinking more about how you would like to support .NET Core in the future? I have finally uploaded an 'official' version with support for IStringLocalizer, 6.02.0006. I still have some open questions, but this is how it works at present. This option is also available in the project options (5th button on the toolbar). IStringLocalizer support applies to Controllers classes and to Views. In principle you can use IStringLocalizer in other classes, but this is not yet supported. Obviously, the first three steps are only required when the first text is selected. The constructor receives the localizer object as a parameter, and stores it in the member variable _localizer. If the class already has a constructor, then the additional parameter and the assignment statement are added to the existing constructor. For this to work, Multi-Language also makes changes to the Startup class. Firstly it adds a using statement for the namespace Microsoft.AspNetCore.Mvc.Razor (if not already present). This is basically boilerplate code required to make the new localization mechanism work. Finally, Multi-Language adds a resource file to the project, as shown in the solution explorer below. All resource files are generated in the "Resources" directory (which is specified as the path in the ConfigureServices function). The directory and filename is derived from the full class-name of the controller class, without the root namespace. The first two steps are only performed when the first string is selected. Multi-Language adds a separate resource file to the project for the view resources, as shown in the solution explorer below. By the way, the resources for both controllers and views are also shown in the resources tab. They can be edited in the resources tab, but not deselected. A little known feature of Named-Resource support is that you can edit the resource name in the resources tab (in the name column). That should also be possible with IStringLocalizer support. That's my initial introduction. I will probably add more details later. In Version 6.02.0008, I have added support for IStringLocalizer in classes which are not Controller classes. 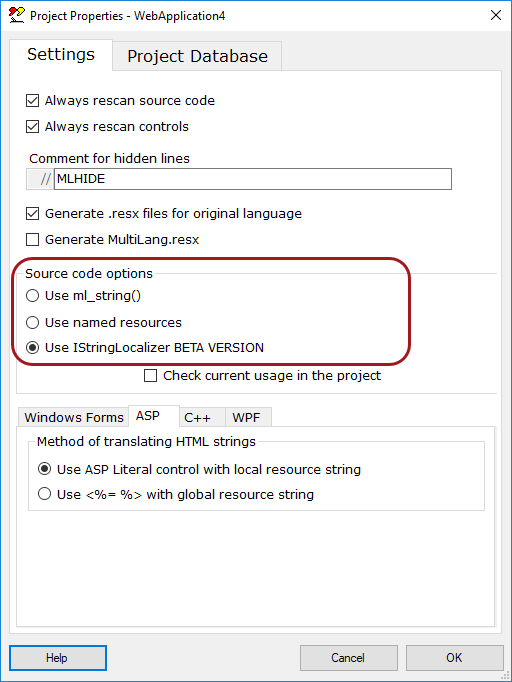 The first time you select a string in a class, you are given a choice whether to localize it using IStringLocalizer or using Named-Resources. If you choose to use IStringLocalizer, Multi-Language will add a _localizer variable and add a parameter to the constructor. However, you will have to make sure that the object is created via the dependency injection container. If you create the class using the new operator, then the mechanism will not work. My understanding of how this works is described in this Stack Overflow question. I am guessing that some programmers will continue create some objects using the new operator, in which case they will have to fall back to the Named-Resources mechanism. First: Waow this looks great! You are on the right track and I like how you approach this! Models are commonly using attributes for validation - and DataAnnotation Localization looks very promising compared to how I register named resources in model's attributes today (using your tool and named resources). Sample Model AS IS. So with named resources I have to assign the resource to be used in every single Model (even though I literally always use the same string for e.g. "Required"). 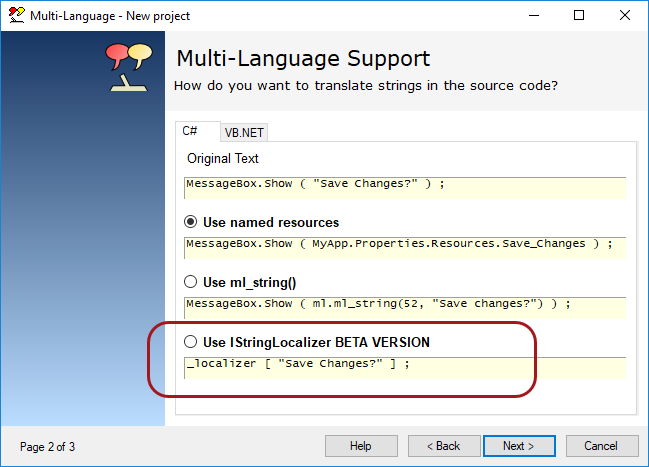 But with IStringLocalization, your tool might be able to setup those shared strings in Startup.cs once - and then ASP.NET MVC will just work in any Model using the e.g. "Required" attribute without any further setup in the Model. With all the default error messages that might be used (and all the other DataAnotation scenarios I properly don't know about yet), your tool might be able to offer a whole lot of value to an ASP.NET MVC Core developer! Suggested way to support "SharedResource"
To fully support a "SharedResource" scenario, the tool might be better off adding a new sheet/tab called "Shared Resources" (like we have "ASP / HTML", "Source code" and "Resources" today) to handle this globally. However to avoid showing a long list of validation strings (including those not in use), this will require your tool to scan for Attribute Type (or ValidationAttribute Type) usage (instead of strings) and from the types found, decide which strings are relevant for the user to translate in "Shared Resources". I know this is more tricky than the DI approach, but I also think this could again set your tool apart from your competitors. sorry I didn't reply in the last two months, but finally this is something I want to move ahead on. I knew I still had to do something for DataAnnotations, but I hadn't looked at it in detail. Aside from you suggestions, it looks fairly straight forward. If an attribute inherits from ValidationAttributes, then the parameters are localizable. Multi-Language should detect them, let you define localized texts and store them in the appropriate resource file (I think in the subdirectory ViewModels). Couldn't you achieve this by deriving your own attribute, e.g. MyRequred, from the Required attribute class? I will try to make an example and post it later. Wouldn't that meet your requirements? The reason for my suggestion would be, to ease localization for the developer using your tool. The idea would be to make it even easier and more intuitive to even notice the standard strings required to be localized. With all due respect, your suggested solution will still require each user to know about the localized strings hidden behind an attribute. User will still have to lookup the english default text in source code (aspnet github) or extract through running their own application and enforcing the error (with the risk of not understanding how parameters should be added etc). It's a fairly long and error prone manual process that you don't know about as a developer (that's why we buy your tool basically ;) because we don't want to deal with such things). Also I was watching the ASP.NET Live Community Standup meeting yesterday, where they talked about localization. They are referring to a blog post about how to store localization in json files and why to use json and how to read with speed (part 2). To be honest I can't evaluate how much of this can be of use to you, but I didn't know about RequestCultureProvider and how to modify it to use the Configuration builder to load (and reload) a json file for localization. I really buy into the point about compiling resx files as a big drawback. I've experienced resx files to slow down compile process significantly with older ASP.NET projects (with e.g. +20 languages and +100 pages with text). Slow compile times leads to slower testing, releasing etc. And I also hate the fact that I need to recompile and release my project to change e.g. just a single string in the view. 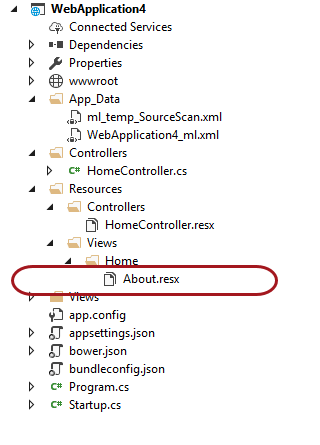 Out of the box without localization it is possible to change "View" strings without recompiling - because that's what the user/designer working with the "View" expects.. A designer shouldn't know too much about C# and compiling..
Well I just found it interesting and relevant to mention in this context. Maybe you could even eventually get mentioned in their weekly show - because you are somewhat an expert in the localization field and trying to make the best .NET Core 2.0 implementation (I assume).